Joseph has an Honours Bachelor of Arts (with High Distinction) from the University of Toronto and a Juris Doctor from Osgoode Hall Law School. He was called to the Bar in 2014. He practices primarily in the areas of real estate, wills and estates, and wrongful dismissal employment law. Joseph is a member of the Canadian Bar Association and Durham Region Law Association. He is also the Treasurer of the Canadian Hispanic Bar Association and has represented them at the US Hispanic National Bar Association. 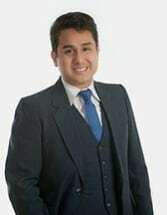 He is also the founder of the Hispanic Osgoode Law Association. Joseph was born and raised in Scarborough and Pickering, and now lives in Ajax. He is proud to be practicing in his community.